Pick up this case of 500 .223 Remington rounds for a fun range session with your AR-15. 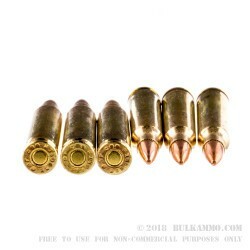 Ideal for any firearm chambered in .223 Remington or 5.56 NATO, these cartridges from Federal fire a 55-grain full metal jacket bullet at a muzzle velocity of 3,240 feet per second, typical for .223/5.56 ammo. Each case contains 25 boxes with 20 rounds per box. Each round uses Boxer-primed reloadable brass cases. 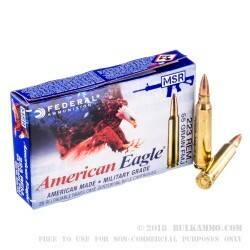 Federal Premium Ammunition markets good quality affordable range ammunition under the American Eagle brand. The company is a leader in the .223 Remington/5.56 NATO market thanks to its extensive experience producing ammunition in the cartridge at the Lake City Army Ammunition Plant in Independence, Missouri. Federal’s headquarters and production plant in Anoka, Minnesota churns out large quantities of ammo in .223 and other cartridges while maintaining stringent quality controls. Federal is a division of Alliant Techsystems, which also owns other renowned shooting sports brands such as Savage, Speer, CCI, and Weaver Optics. It runs just fine in my Ruger ar-556. Very pleased with the Federal ammo. I fired 100 flawless rounds at the range through a new Bushmaster AR 15 & it really performed. Both the ammo & the AR. Some cheaper ammo can leave your gun dirty, but federal was so clean. As a former service man in the Army. The 55gr. 1-9 twist this ammo hits it's mark OK . Shoots fine at rapid fire. I broke in a new AR with this and at 300 meters I was hiting in 3 to 5 inch groups with a 100 rds. Bought a PSA AR15, 1:9 16 inch barrel and it loved this ammo. Shot 400 rounds without a problem. Good accuracy, no jams or misfeeds. My 1:8 rifle loves this ammo.... it's clean and accurate. No problems, just great accuracy and consistency. Great Ammo at a great price with great shipping! Great job in delivering product,..I have recommend you to several companies.. Drama Free Transaction..Shipped Fast. Shoots Fast. 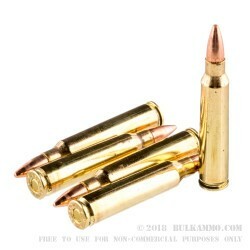 Bulk Ammo is the Real Deal.. Thanks Again! Everything is great..I couldnt be more Happy with your service as well as your product.. you can count on me as a repeat customer. Big Thank you to the Entire staff for making it happen..I appreciate it and that goes a long way with me..
Ammo chambers perfect with no misfeeds or misfires. A: Hello Mike, These 55gr. FMJ rounds by Federal have a muzzle velocity of 3240 fps. They make excellent target rounds for your .223 firearm. Q: Is this steel jacket or core (magnetic)? A: Hello, These 55gr. FMJ rounds by Federal in .223 have a lead core, copper jacket, and brass case. They are non-magnetic and will not attract a magnet. A: Hello George, These 55gr. FMJ rounds by Federal in .223 are made in the USA. They will function great in any firearm chambered in .223. Q: is this ammuntion reloadable? 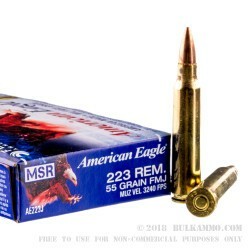 A: This Federal American Eagle 223 Rem ammo is reloadable. The brass is factory new and boxer primed for reloading. All components used are non corrosive. Q: Like most ARs (from what I hear/read) my gun doesn't like steel cased ammo or lacquer coated ammo. Given these constrictions, what would be your suggestion more ammo to buy in bulk and store? Thanks! A: If your rifle only shoots reliably with brass cased ammo, this American Eagle ammo would be a great choice. It is American made, to the highest quality standards.